"Roy Hodgson's men lost just eight of their 30 league games last term when Zaha did start, so his importance to the team should never be underestimated." Before the international break we learned that Manchester City don't always thrash the lesser lights at the Etihad Stadium, that Arsenal still can't defend, and that if ever a team can be described as 'one-man' then it's Crystal Palace. 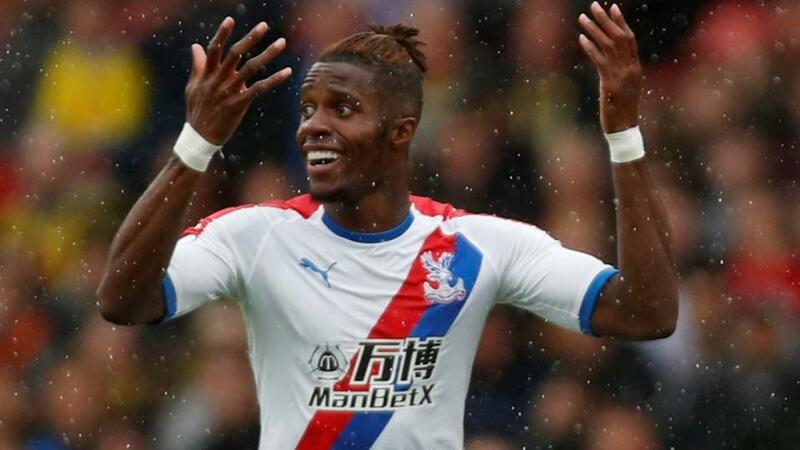 The Eagles were well fancied to beat Southampton at Selhurst Park, but as soon as the teamsheets were in, and it was known that Wilfried Zaha wasn't in Palace's squad, then their odds on the Exchange to win the game drifted like a barge. And they were right to drift. Palace were defeated 2-0 by a team that had failed to win any of their previous games this season, meaning that, quite incredibly, the last 11 league games Palace have started without Zaha they have lost them all. That's damning enough, but the fact that they scored just four goals in those 11 defeats is also alarming. Roy Hodgson's men lost just eight of their 30 league games last term when Zaha did start, so his importance to the team should never be underestimated. He's their star act, their talisman, their top goalscorer. And thankfully he should be back to face Huddersfield on Saturday. Which is why I'm going for an away victory because a full strength Palace side really should be good enough to beat a Terriers team that is yet to win this season, has failed to score a single goal on home soil so far, and conceded nine goals in two matches against Chelsea and Man City. Of course, David Wagner's men won't be the only team this season to suffer a heavy defeat at the hands of some of the big boys, but conceding so many goals at the start of a campaign, losing to a lower-league side in the EFL Cup, and failing to score at the John Smith's Stadium, can't do much for confidence at this early stage. Huddersfield are amongst the favourites to be relegated this term, Palace - as long as Zaha stays fit no doubt - are fancied to finish top 10, and I fancy the difference in class will tell on Saturday afternoon. Manchester City weren't at their best in a similar match-up just before the international break when they could manage just a 2-1 home win over Newcastle. I fancy it will be a different story on Saturday afternoon. The Magpies are renowned for shutting up shop under Rafa Benitez against one of the big boys, happy to lose by a small margin without giving it a real go at the other end. The day a Benitez side avoids relegation on goal difference will be the day I applaud those tactics, but until it happens then I just don't understand it. Okay, a 'big six' side might only lose once at home in 20 games against a lesser team, but one thing is certain, you won't be that team that causes the shock unless you're prepared to have a go. Fulham certainly give it a go when they played away to Tottenham, and they nearly got rewarded. They levelled at 1-1 and could easily have gone 1-2 up before eventually losing 3-1. Slavisa Jokanovic has previously said that his side should relish the opportunity of playing against the big clubs in England and that they should never fear them. That suggests to me that his Fulham line-up will have a go on Saturday, and I think they should be applauded for that, even if it results in a heavy defeat. There's always a chance that the Cottagers can be that '1 in 20' team that catches the champions on a bad day, but the odds are massively stacked against them. If they score early enough, and Fulham try and respond by playing a more attacking game, then City could end up winning easily. But you know what, I'd rather see a team lose by three or four knowing they tried to score a few than a team that simply sets out to keep the score down to a minimum. Unless you get relegated on goal difference of course! I think Arsenal should have enough class to win this game, but backing them at odds-on away from home on current form isn't my cup of tea. I believe they'll improve as the season progresses, but you'd like to see them beat the likes of Cardiff and Newcastle with ease if having any confidence in backing them at odds-on. What Unai Emery's men have shown so far this term is that they still have massive problems defensively. And if Petr Cech continues to try and pass it out from the back - you sense the fear every time the ball is at his feet - then games featuring Arsenal this term could be highly entertaining. The Gunners have already conceded eight goals this season in just four games, even conceding two against a Cardiff side that failed to score in any of their previous three league matches. But Emery's men have also scored eight goals, meaning that their games this term are averaging exactly four goals per match. On that basis alone odds of [3.0] about Over 3.5 Goals seems worth a punt here. Those of you who are keen to point out a contradiction might suggest that I've already said in my Man City preview that Newcastle under Benitez tend to shut up shop against one of the big boys. I stand by that, but right now I don't think the Newcastle boss will regard Arsenal in the same class (or form) as a Manchester City, Liverpool, or Tottenham. And with home advantage, I'd be amazed if Benitez doesn't set his team up to try and get at Arsenal's fragile defence. The game should be a really entertaining one, and I won't be surprised at all if it ends up having at least four goals. Both teams will fancy their chances, and there should be plenty of scoring opportunities at each end.